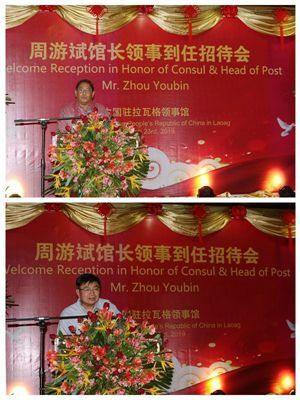 On March 23, 2019, Consul & Head of Post to Laoag Zhou Youbin Held in Fort Ilocandia Resort Hotel the reception marking his assumption of office. More than 300 people were present, including Hon. Governor of Benguet Cresencio Pacalso, Hon. Vice Governor of Ilocos Norte Eugenio Angelo M. Barba, Hon. Vice Governor of Ilocos Sur Jeremias C. Singson, Hon. 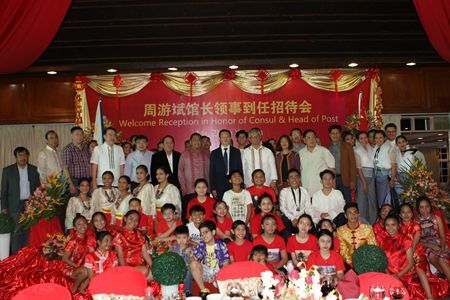 Board Member of Ilocos Norte Donald Nicolas and Vicentito Lazo, senior officials from local government, representatives of Chinese communities associations, local Chinese schools, Chinese volunteer teachers, and friends from all walks of life in Consular District. 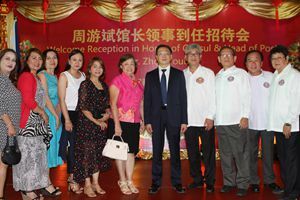 In the speech, Consul Zhou commented positively on the friendship between Chinese and Filipino in North Luzon and the region's development these years. Last November, Chinese President Xi Jinping successfully paid his first state visit to the Philippines. Together, President Xi and President Duterte decided to elevate the relationship to the one of comprehensive strategic cooperation, which guided China-Philippine ties to enter a new golden age with comprehensive rapid growth, and would definitely bring more benefits to the people of the two countries. 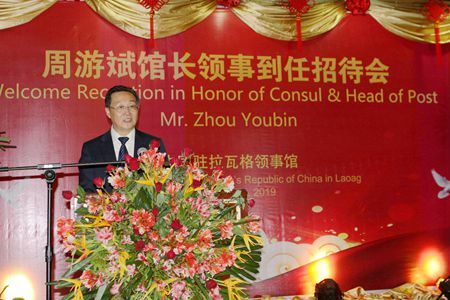 Consul Zhou introduced the great achievements of China since the establishment of the People's Republic of China over the past 70 years, and the quick development of practical collaboration between China and the Philippines. He pointed out that China was willing to share the opportunities with neighboring countries especially the Philippines, under the framework of 'belt and road' initiative, to achieve common prosperity. He reviewed the work of the Chinese Consulate in Laoag in recent years in promoting the friendship and cultural exchanges between local provinces and China. 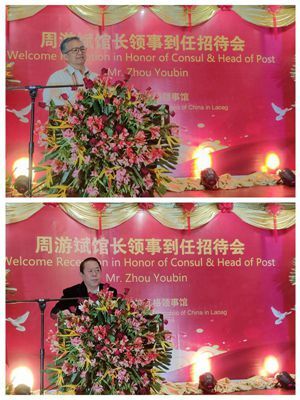 As the sixth Consul and Head of Post, he felt greatly honored with the mission and responsibility, and would be committed to extending China-Philippine practical cooperation and friendship. Governor Pacalso, Vice Governor Barba, Vice Governor Singson, and Mr. Jaime Go, Principal of Santiago Chinese Cultural Institute, made warm and friendly speeches to welcome Consul Zhou on his assumption of office in Laoag. 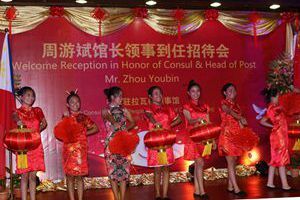 They praised Filipino Chinese Communities for their contributions to the local employment and development. They said, Chinese great achievements had attached worldwide attention. 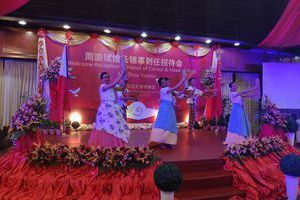 The provinces in the North Luzon shared a long history in the communication with China due to the close distance. 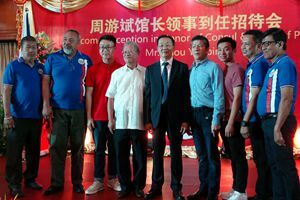 Therefore, the local governments were eager to follow President Duterte's leadership, seize the opportunities, and work together with Chinese Consulate to strengthen the collaboration with China especially in the fields of agriculture, tourism, and education. Consul Zhou had cordial conversations with the guests during the reception, which was immersed in a friendly and joyous atmosphere. During the reception, students from Mariano Marcos State University, Paoay National High School, and San Santiago Elementary School presented wonderful Chinese and Filipino songs and dances, gaining warm applauses and fully demonstrating the cultural integration and the ever-growing friendship between people of two countries.